CHESTNUT HILL, Mass. - The No. 4/4 Boston College women's hockey team fell to rival Boston University, 3-2, on Friday night at Kelley Rink. The Terriers opened the scoring, converting on the power play just over six minutes into the first. BC had several looks in the rest of the period including a 5-on-3 late in the frame that saw the team put four shots on goal but Kate Stuart made all four saves. After trading some penalties early in the second, the Eagles and Terriers found themselves in 4-on-4 action and BC was able to capitalize on the extra space as Daryl Watts pulled BC even on her 10th of the year. However two power-play goals in the first 15 minutes of the third period made it 3-1 in favor of the visitors. Makenna Newkirk scored late in the third and BC pulled Maddy McArthur for an extra attacker but couldn't net the equalizer. 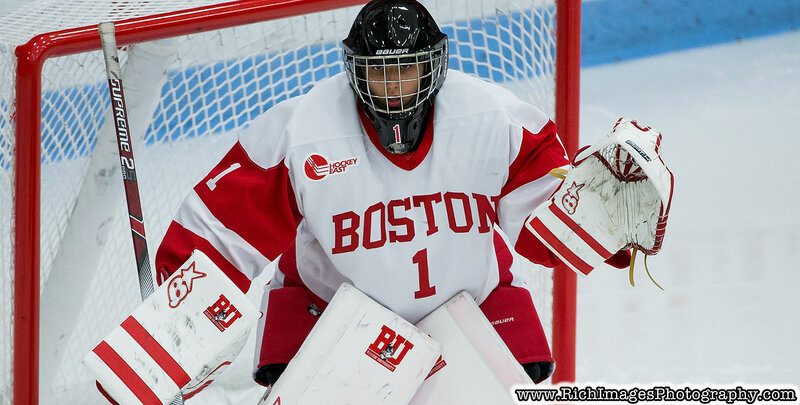 Kate Stuart finished with 42 saves for the Terriers while McArthur had 13 for the Eagles. BC held the 44-16 edge in shots on goal but went 0-for-7 on the power play while BU went 3-for-8. Friday, Nov. 30, 2018 | 6 p.m.
1st, 6:44 | 0-1, BU GOAL: Working on the power play, Sammy Davis got the puck at the right dot and fed it across to the other dot to Jesse Compher. Compher dished the puck in front where Nara Elia redirected it inside the right post. 2nd, 7:09 | 1-1, BC GOAL: While playing 4-on-4 hockey, Watts sent a slap pass to Megan Keller at the left circle and the senior cut in towards goal and shoveled the puck to the net. The loose puck popped back out to the bottom of the left circle and Caitrin Lonergan got it, put it back in front for Keller to push over to Watts at the right post - where she squeezed it in between Stuart's left pad and the post. 3rd, 3:41 | 1-2, BU GOAL: A loose puck in the crease was pushed to the right post by Natasza Taranowski and Deziray De Sousa. Emma Wuthrich dropped down low and lifted it home for a power-play goal. 3rd, 14:22 | 1-3, BU GOAL: Davis worked the puck to Compher in the right circle for a wrister that beat McArthur's glove just under the crossbar. 3rd, 17:17 | 2-3, BC GOAL: Grace Bizal put a shot on goal and the rebound popped to a camped-put Keller at the top of the crease. Keller slid the puck to Newkirk at the right post to tap in. - The Eagles now have a mark of 29-18-7 in the all-time series with the Terriers ... BC is 12-8-4 against BU at Kelley Rink. - Seven of the last eight meetings between the two rivals have been decided by one goal or less. - Twenty-two of the 54 meetings between BU and BC have been decided by one goal or less. - Makenna Newkirk's point streak now stands at seven games. - Grace Bizal bumped her assist streak to three games while Daryl Watts moved her goal streak to two games. - Watts earned her 99th career point with her second period tally. The Eagles and Terriers will wrap up the regular season Hockey East series tomorrow afternoon with a 3 p.m. game at Walter Brown Arena.